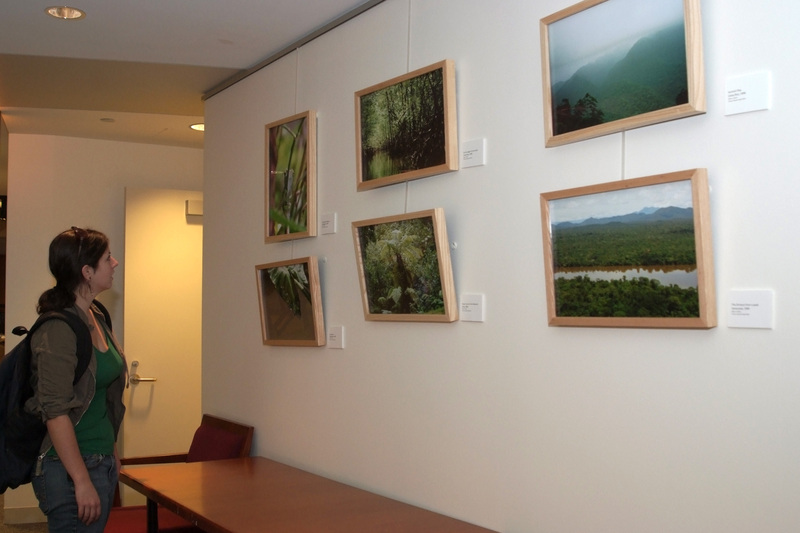 Prince Hussain Aga Khan’s photographs of nature, landscape and wildlife which make up the exhibition at the Woodrow Wilson Center under the title “And on the last day plant a tree”, a saying attributed to the Prophet Muhammad, were taken during his travels around the globe. 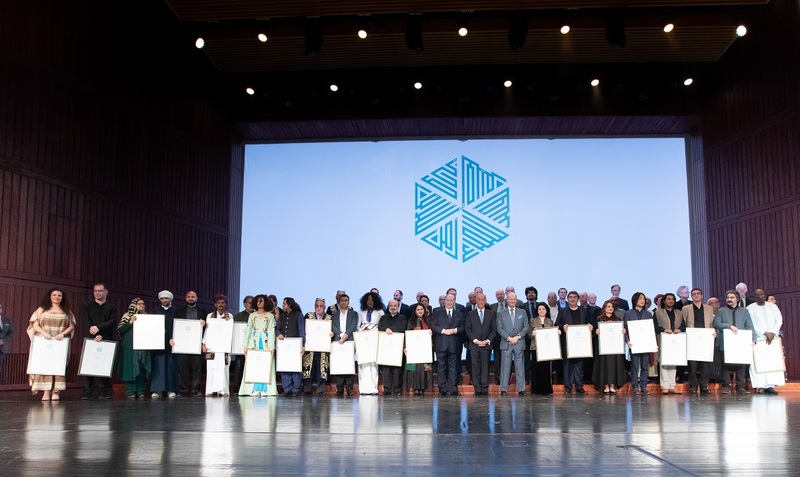 Some of these images are framed for the exhibition and some are used as posters with good effect to demonstrate the work and sites that the Aga Khan Development Network is building and implementing worldwide. There is no doubt in my mind that Prince Hussain’s task of organizing this exhibition was monumental from the number of images that are shown. The editing that needed to be done, the presentation of the images to ensure there is a good and proper placement and that the relationship among the images remains intact as they hang together on the walls of the Woodrow Wilson Center are some of the challenges that had to be met. 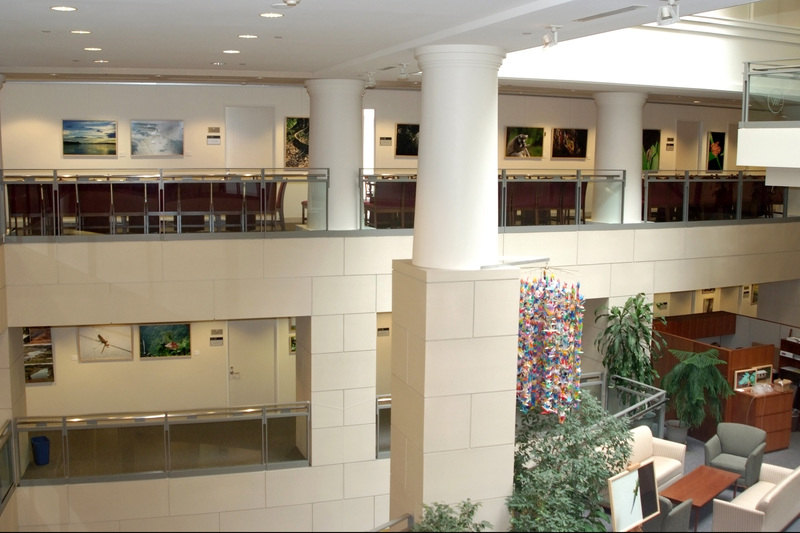 Furthermore, the images and posters are spread out on two levels at the Center and I should say the sequencing of the images works very well as one moves around the halls and the atrium. Light is the single most important factor in making photographs. First, because without light there would be no photographic images. After the amount of light a photographer must reckon with, the quality of light is another critical factor. The quality of the light, how strong and bright it is or how soft and diffused fundamentally influences the photograph’s quality and even its content. In Prince Hussain’s work, we see several different kinds of light, most of the time from the sun but also, on occasion, from his flash. When one travels as extensively as the Prince has done, the matter of timing of capturing images is an essential part of the creation of the images. There is the element of luck which the photographer must be prepared to utilize, namely when the Prince came upon animals in scenes that absolutely needed to be captured, and it is quite clear that his camera was ready as he prepared to make the image. He was able to get the exposure right as well, instantly creating the framing with the right lens for his goal for a particular image before the animal left the scene. However, there is also the matter of the light that is available to him and by which he may photograph his subjects. 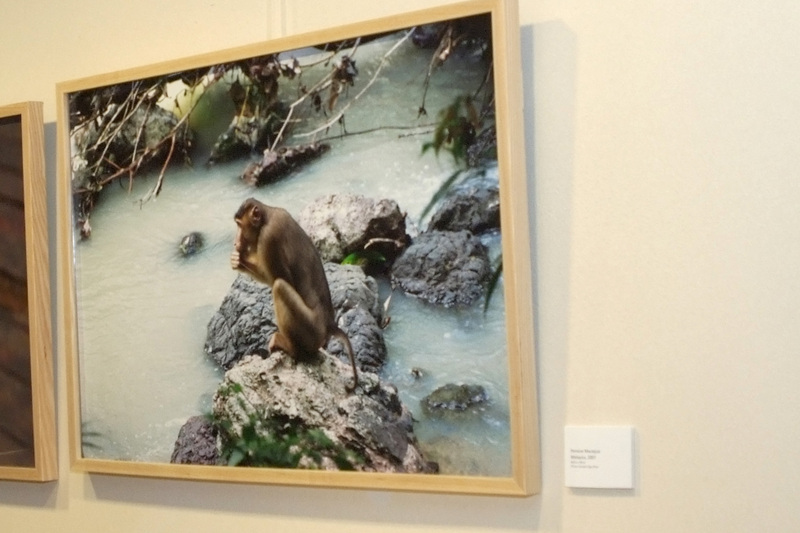 With animals, no doubt his favourite subject, his eye is sure on many occasions and there are two images that stand out in the exhibit where all the elements come together. The first is a gecko on the edge of a white wall. 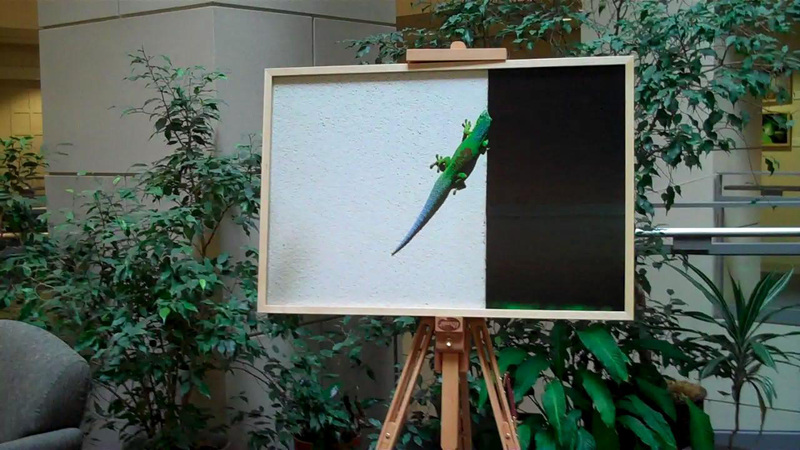 This image is set on an easel in the seating area of the atrium and one simply cannot pass it by without being struck by the simplicity and yet graphic image of the white of the wall, the green of the gecko and the black of the space beyond with just a touch of echo-like green of the gecko in the bottom right of the photograph. 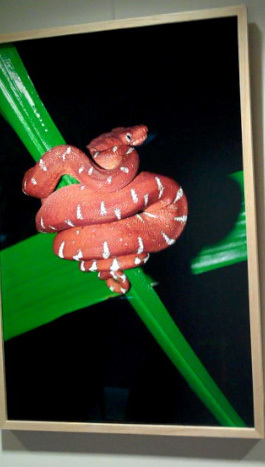 Then there is another image of the reddish snake curled around a green leaf, ‘Juvenile emerald Tree Boa” Ecuador, 2001 – where I believe the Prince has used flash – that is also a stand out for its simplicity and graphic nature. The shadow that the snake casts from the light of the flash adds to the mystery and beauty of this image. And in this vein of simplicity and graphic qualities, there is the praying mantis standing on a plain grayish pavement with a diagonal crack in it that is a more subtle version of the high impact graphic images. It is almost a transitional image from the strong and powerful colors of the red snake and the green gecko to the muted tones of some of the monkey images. There are other simple images of green leaves with a butterfly and of frogspawn but the above, for me, stand out as the strongest of his work. One wishes that had the Prince had the time to get to some of the locations just at dawn or at twilight than the drama of the images would probably have been enhanced. The blandness and yet very strong force of light from the midday sun is an obstacle that every landscape and nature photographer, especially, must deal with. His photographic journeys down rivers and the vistas around valleys and mountains might have been greatly enhanced by making those images at a different time of day. Twilight and dawn are called the ‘golden time’ because the light has a special quality that can impart a beauty to a scene, and there are river images where I wished for an extra moment earlier or later in the day. But having to deal with the location and time of sunrises and sunsets adds a burden of time to the photographer’s travels. The Prince, I believe used his flash well and judiciously but he did lose some control of the highlights in his scenic views. This might have been corrected by bracketing his images, that is, making the image repeatedly at different exposure settings so that he would have a greater selection of images from which to choose the best one to print. And some of the scenic views have an indeterminate quality because of mist or the wrong time period of the day. Misty scenes can be remarkable and mysterious but it takes a practiced eye to create the image that can convey the landscape in the diffuse light that mists impose. His one attempt at night photography is a little too confusing. I personally love night time photography and dark images, but here working at the scene harder at different f-stops and or shutter speeds might have helped him to choose the best resulting image. There’s a large reflection of a bright object and I can only assume it is the moon.The standards for the tight control of dark and light areas as well as the saturation of colors in images have been raised significantly in the photographic community with the expected use of Photoshop software in what is called the postproduction phase (the digital tasks that have replaced the use of the darkroom). It enables the photographer or his lab to have much greater control of the quality of photographs and I think that with its use the saturation and contrast in some images might have been increased resulting perhaps in more effective photographs. Continuing on with the exhibits, the ‘Three-quarter portrait, Monkey’, Indonesia, 1996 (not shown here) has a lovely sense of mystery because of the Prince’s framing of the monkey. The monkey is eating a banana and a documentation of the animal with its banana might have been just, as we’ve seen these animals in the zoo countless times. But the photographer has framed the animal so its fur recedes and merges with the background darkness and we have a sense of the mystery of animal life in the wild. On the same wall there is ‘Anonymous Bird, Malaysia, 1997’ (not shown). When photographers make a monochromatic image in color, it often is a nice surprise and gives our eye a little rest from all the intense colors in the rest of an exhibit. There’s also a surprise waiting for the viewer in this image because there is a second egret-shaped bird on a branch of this dead tree, balancing the image very successfully. Where the color saturation is well thought out and used to make graphic images, the Prince’s photographs are the most successful. For this viewer, the landscape images in general don’t come up to the same standards as the graphic animal images. This is not to say that some photographs, which have lovely muted tones, should be tossed by the wayside. ‘Palms 1 in Borneo, 1996’ was shot with an overcast sky that works very well – a lucky moment that the photographer was prepared to use to the image’s advantage. Prince Hussain achieved the soft light in the image with strong and dynamic shapes and thorough saturation of the greens of the palms. The palm fronds have a beautiful modulation and a thorough saturation of color that is undeniable. The black water enables this image to have a sense of excellent contrast in spite of the grey sky. The very absence of a clichéd blue sky helps to makes this image successful. And, of course, without bright sunlight, there is no problem about any highlights on the leaves. There is a lovely image of a monkey, I believe done in 2001, by a stream where the colors are very delicate. Clearly the day was overcast or perhaps there might have even been a drizzle. The viewer gets a sense of the peace and the quiet of this scene where mankind has not yet encroached. One can almost hear the stream rushing by. 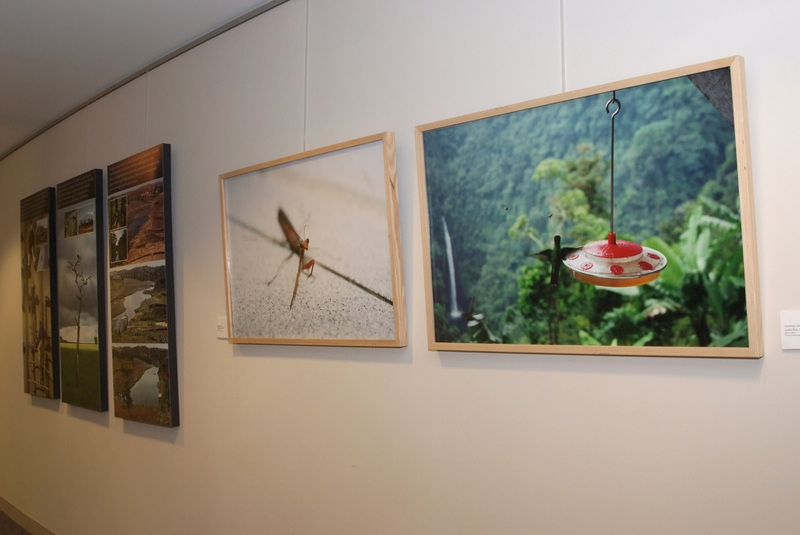 The interaction of man and wildlife is shown in the hummingbird image with a plastic feeder, ‘Hummingbird and bees, Costa Rica, 1998’ (see third photo above). This bird, the bees behind it and the waterfall in the distance almost make a marvelous image. However, the shutter speed of the camera is not freezing the motion of the bird’s wings nor stopping the motion of the bees. One wishes here that the Prince had had more time to play with shutter speeds and f-stops to capture the motion of the bird’s wings and the bees and the juxtaposition of the man-made plastic feeder and the grandness of nature in the distance. The exhibit gives us a sense of the variety of environments on our habitat and the creatures that dwell within. Considering that photographing animals is his hobby and not his main activity in life, Prince Hussain has made a remarkable effort with his work in this exhibit and I wish him the best and hope he continues this work with the inclusion of Photoshop in his workflow in years to come. 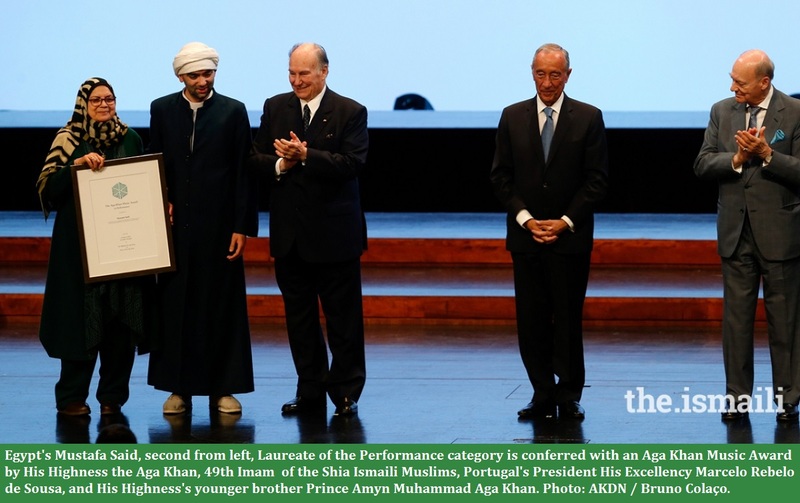 In addition, the inclusion of the posters explaining some of His Highness the Aga Khan’s work brings us back to reality and the work the Prince’s family is engaged in. The use of the Prince’s images for the posters is effective and a worthwhile place for his work. 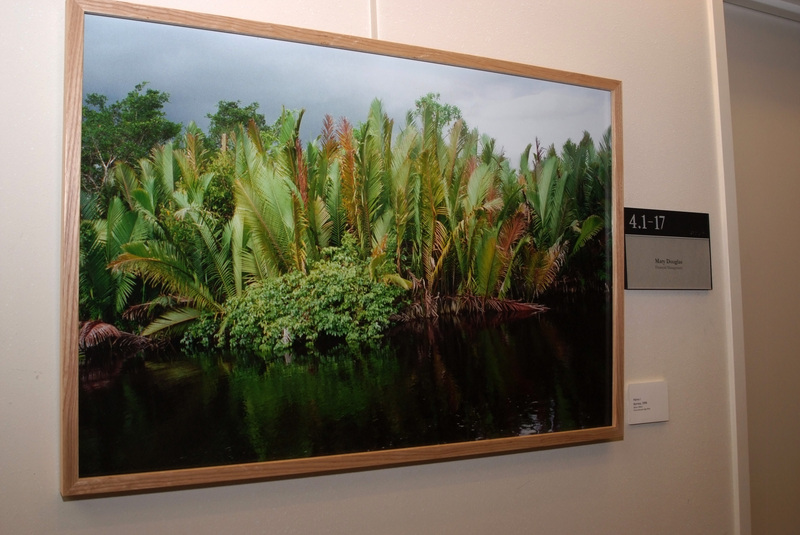 The exhibition continues at the Wilson Center until October 23, 2009. Please visit the Events page of the Woodrow Wilson website for location and other general details about the exhibition. Text and Photos: Copyright http://www.Simerg.com and Vivian Ronay. I wish Prince Hussein everlasting success in all his endevours. Hazar Imam Said And I Quote: The Quran Refers Very Often To Nature As A Reflection Of Allah’s Power Of Creation. And It Says, Look At the Mountains, Look At The Rivers, Look At The Trees, Look At The Flowers, As Evidence Of Allah’s Love For The People Whom He Has Created. 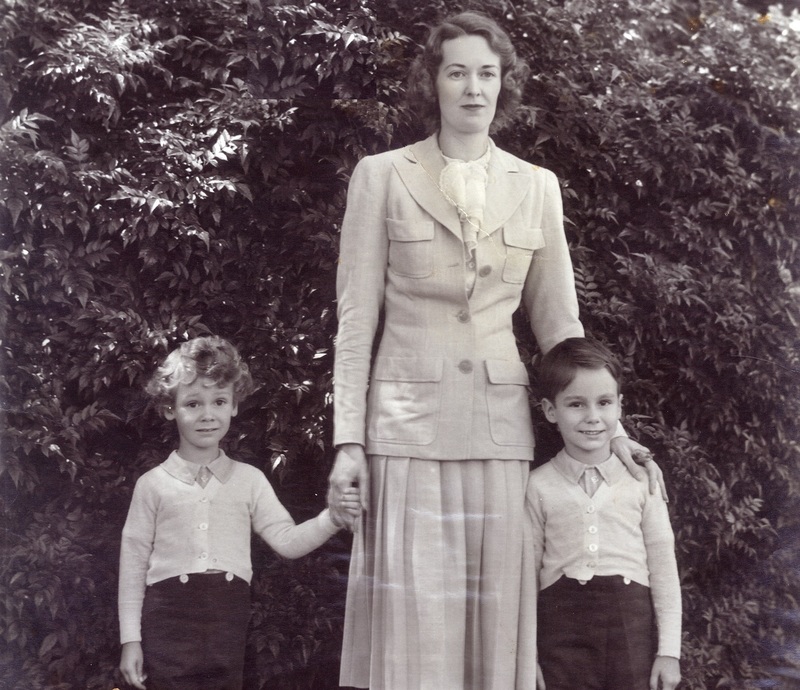 End Of Quote, that’s what Prince Hussein did in the Photographs. Awesome. Thank you for sharing. It is a superb endeavor, very impressed. I was extremely happy to see the work of Prince Hussain. I am very much impressed. 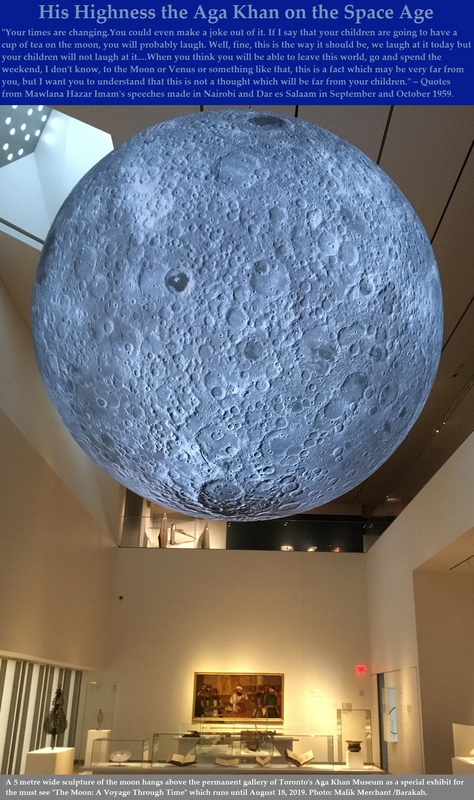 Is there any chance that this exhibit would come to Ottawa at the Delegation of the Ismaili Imamat? or is this just wishful thinking? Thank you for your efforts Malik!! My thought process questions the very concept of Nature as seen in Islam that Prince Hussain has committed himself to explore and show the world via such exhibitions in the Western World. He is not merely ‘exploring’ nature for its own sake. This is so profound and is not to be overlooked or seen just superficially! Great pictures – it must be wonderful to see it live and capture the moment. Moments such as these stay with you for the rest of your life. Given the time and ability, these can be captured in your back yards. Look and you will see. Regards, Amir. Thank you. This review has provided an excellent understanding of the exhibition of Prince Hussein’s works.